Firefighters spent several hours battling a fiery blaze Thursday evening after half a dozen angry ravers torched the Chez Melodies music store in Mile End. 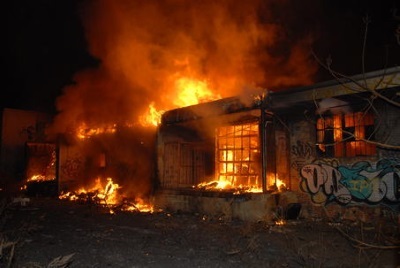 “We managed to arrest two of the arsonists thanks to the help of several eye witnesses,” says police spokesperson Wayne Cullo. “Their fast thinking put an early end to what could have been a dangerous crime spree. They saw the ravers run, they followed after them from a safe distance, and they kept us on the phone until we could take over the chase." The police say that the arsonists were targeting music stores that sold instruments. “The arsonists call themselves techno purists, and believe that all music should be entirely computer generated,” says Mr. Cullo. “They say they’re at war with music instruments. If it’s acoustic, if it has strings, if it has keys, than it’s archaic and needs to be destroyed." Many artists fear for the future. “EDM fans are waging a holy war against the old ways,” says guitarist Lisa Kipper. “They think that artists who play instruments are holding back techno and that for techno to survive, we need to die." Rave promoter Noah Thibeault agrees. “I don’t share the techno purists methods but I agree with their goals,” says Noah. “Computers and things that you attach to computers are the way forward. The more primitive it is, the more important it is for us to move on from it — how can we embrace the future of music when we insist on living in the past? Down with musical instruments, up with techno!"